To celebrate my (finally!) 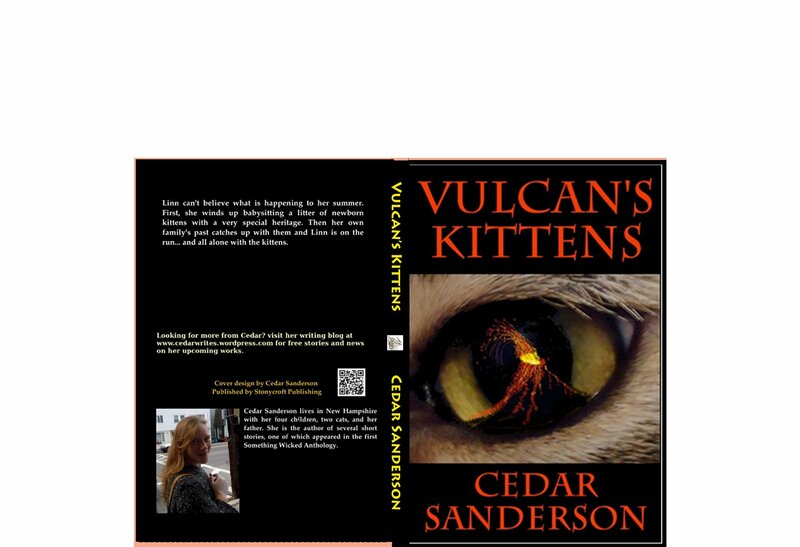 getting the spine properly formatted for the print edition, here is another snippet of Vulcan’s Kittens. If you would like to read the first snippet, look here before you start on this one. To buy a print copy, click here. The full cover for the print version. “Whah?” She sat up and rubbed her eyes. She was on the couch, covered in the afghan. Sekhmet was nowhere to be seen. For a fleeting second she wondered if she had dreamed it all. “Thank you, Grampa.” She scrambled out of the tangle of afghan and headed for the loft and day clothes. Linn could hear them when she got into the barn. Little sonic shrieks, so high she almost couldn’t make them out. Getting the milk crate up the ladder was difficult, and when she got her head above the floor she could see that all four kittens were trying to climb out of their hay bale corral. She scrambled up and patted heads. The black one sucked on her finger while she fumbled for a bottle with the other hand. “How am I supposed to feed all of you at once?” She muttered. She compromised by taking them out one at a time and holding them in her lap to feed. They were bigger than she remembered, even from last night, and she thought their mother must have been keeping her from seeing the reality when she first met them. Two of them – the black one and the calico – had their eyes open just a little. Full tummies meant nap time, and she cuddled the spotted one that had been last fed while the other slept in a boneless heap in their corral. Linn thought this might be the most she’d ever heard her grandfather talk. He looked down at her. He wasn’t all that much taller than she was, any more, and his craggy, bearded face hid the lopsidedness that was his downfall from Olympus in the first place. “Maybe.” was all he said. Linn sensed she wasn’t going to get more out of him right then. They ate in silence, and then he sent her back out to the kittens, with an armful of bedding. She was going to sleep in the loft with them that night. Linn amused herself with trying out names for them. “Athena?” she picked up the calico and inspected the little blunt faced kitten. The tiny ears were more rounded than a regular kitten’s would be. Want the whole story? You can buy the ebook on Amazon! Tags: Egytian Mythology, Kittens, Mayan Mythology. Bookmark the permalink.